BANGI, 19 Jun 2014 – Indonesia is ready to lead ASEAN when its regional Economic Community is formed by 2015, the governor of South Sulawesi (Sulsel) province Dr H Syahrul Yasin Limpo said. Delivering his lecture on Indonesian Leadership: Prospects and Role in the ASEAN Community at The National University of Malaysia (UKM) here today, he said it has the necessary characteristics to make ASEAN the leading economic region after the era of the burgeoning Chinese economy had passed by. Syahrul Yasin said Indonesia has outperformed the other ASEAN countries in economic development and is capable of mapping a strategy to make South-East Asian economies the powerhouse not only on Asia but even the world. He said Indonesia with a US$834.6 billion in Gross Domestic Product (GDP) tops the ASEAN countries followed by Thailand with US$318.8 billion, Singapore (US$266.5 billion) and Malaysia (US$247.6 billion). What has helped Indonesia’s rapid economic growth is Sulsel province’s oil and gas sector as well as its marble quarrying works. 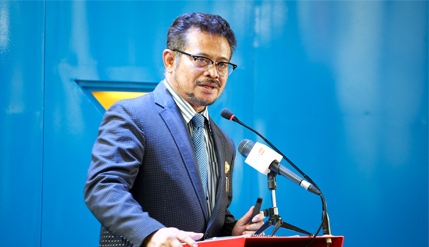 Sulasel also has a fertile agricultural sector and Syahrul Yasin welcomed Malaysian entrepreneurs to invest and be partners to business enterprises there like in fruit orchards. He said Sulsel registered a growth of 8.65% exceeding the Indonesian national average growth of 6%. His visit to Malaysia was to lead a Sulsel trade delegation and had called on Prime Minister Dato’ Sri Mohd Najib Tun Abdul Razak at Putrajaya before delivering his lecture. The lecture was organised by the South Sulawesi Indonesian Students Association of Malaysia (IMSSIMA) aimed at providing information about the province as well as opportunities for commercial partnerships. Syahrul Yasin also urged Sulsel alumni of UKM to return to their homeland after graduation as there are many job opportunities in the province if they are persistent and patient enough to wait for the results of their efforts. “I know you can find jobs that pay better in Malaysia than in Indonesia but companies back home are waiting for you” urging the professors and doctors to go back home after their studies. He said an integrated ASEAN economy is necessary with all the member states taking part in the plan to reduce trade barriers. “That’s what we want – a borderless trade after 2015. We will get the involvement of the people in the ASEAN integration process for the betterment of all,” he said. He expected ASEAN to change its approach from focusing on nations to becoming more of a people-centric community which requires all member states to be more interactive, stable and knowledgeable in their relationships. The concept focusses on political community safety, economic community and socio-cultural community with the motto “One Insight, One identity and One Community”. Syahrul Yasin is the first directly elected governor of South Sulawesi and had been the mayor of Gowa for two terms after which he was appointed deputy governor before winning in the general elections to become governor. ASEAN is made up of Malaysia, Indonesia, the Philippines, Singapore, Thailand, Brunei, Vietnam, Laos, Myanmar and Cambodia.